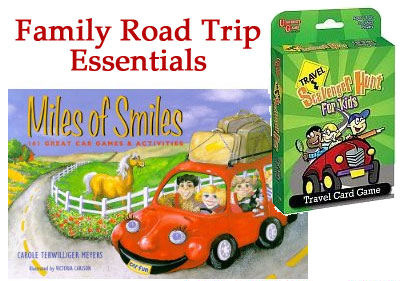 This is part three of three in my series on How to Plan a Successful Family Road Trip. Read part one, Planning an Itinerary, and part two, Packing and Safety. Regardless of the exciting activities you have planned, there will be stretches of time “enjoying” one another’s company in the car. Pack a bag of activities for each child that might include books, crayons, pens & pencils, action figures, Etch-A-Sketch or Magnadoodle, travel bingo, drawing pad or notebook, electronics, and other items your kids will enjoy. It’s always fun to get them some “surprises” too – a new DVD, book, toy or game can keep things fresh and keep you sane. : Each person is dealt five cards depicting various things you might find on the road. There are the usual items, such as stop signs and hotels, but there are also some fun ones, like a “person with orange hair,” and a “really dirty car.” When you see the item on your card, you call it out, put your card aside, and draw a new one. There are also swap cards that let you exchange cards if you’ve got a particularly difficult one in your hand. The first person to find 10 items wins. The game goes pretty quickly and my kids always ask to play again. I love that it makes everyone look up from their devices and outside at their surroundings. : This book is full of fun facts, trivia and games that will keep kids and adults talking and laughing. One of our favorite games from this book is called “What Am I Counting?” One person starts counting something out loud and the rest of the passengers have to figure out what they are counting. It’s a tough game! Is he counting traffic lights? Trucks? Surveillance cameras? With proper planning and preparation, a lengthy road trip can form the experience of a lifetime. Build in extra time, be prepared, pack light, and have fun!